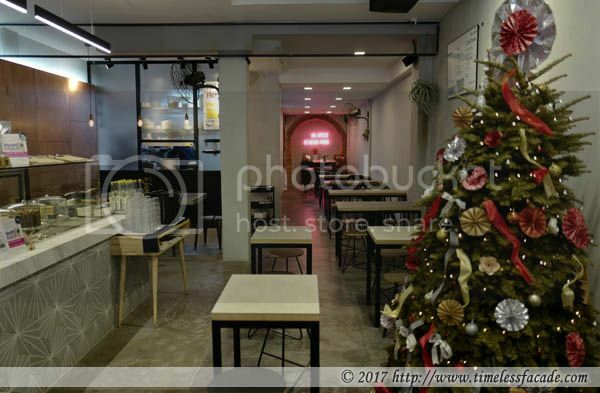 We were quite a fan of Ninja Bowl @ Duxton so when we found out that there was a sister outlet (Ninja Cut) closer to us at Seah Street, we decided to drop by to give it a shot (as at time of writing, we have been there at least 4 times). 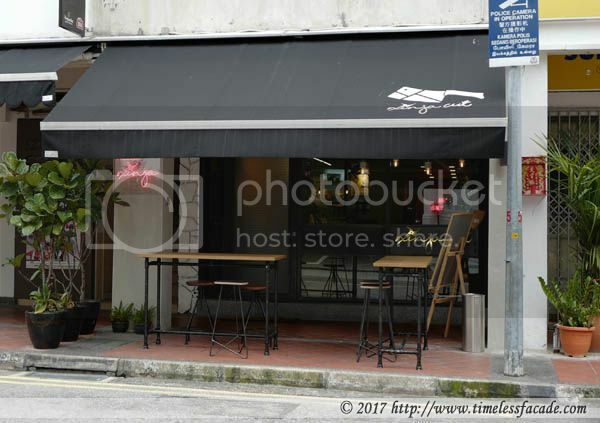 Hidden amongst the plethora of shophouses along Seah Street and just a few shops down from the MINT Museum of Toys, Ninja Cut sports a nondescript facade and is easy to miss unless you pay close attention. The interior is rather spartan but comfortable enough. Noise is a pertinent problem here so conversations can be challenging especially when the place is full. 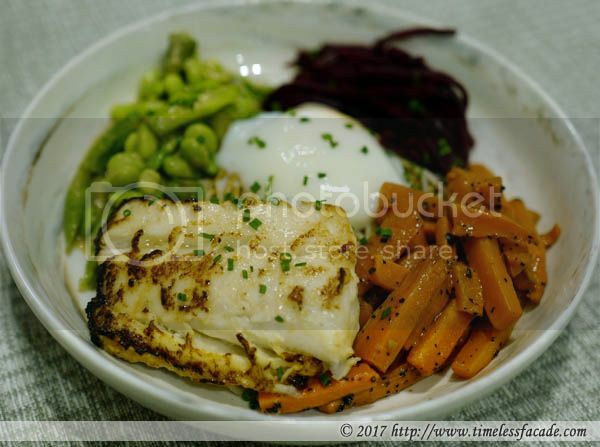 This rather sizeable and sweet slice of cod was nicely pan fried but lacking in silkiness; served with a edamame asparagus combination (a little too salty for my liking and didn't quite seem to jell with the dish), mildly sweet carrots, a wobbly onsen egg and pickled purple slaw. Decent for the price but I'll probably swap out the edamame and asparagus the next time round. I've had this thrice but I personally feel that the beef in one of their brunch items, Ninja's Steak & Eggs, tastes better. The beef here is a wee bit overcooked and a tad too chewy for my liking. 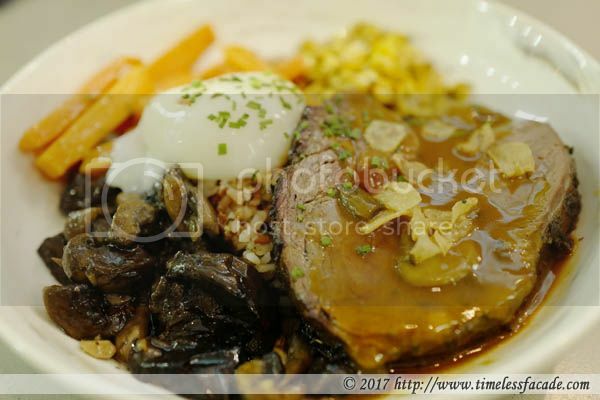 However this dish comes with mushrooms, sweet corn, onsen egg and carrots for for that relatively delicious all rounded meal. You can opt to add rice, soba or salad for an additional $2. Everything is priced below $20 so it's quite a good deal for the quality and quantity of food in my humble opinion. There is no GST or service charge which is a plus and you get free, self service iced water. Do note that this place only accepts cash or nets. 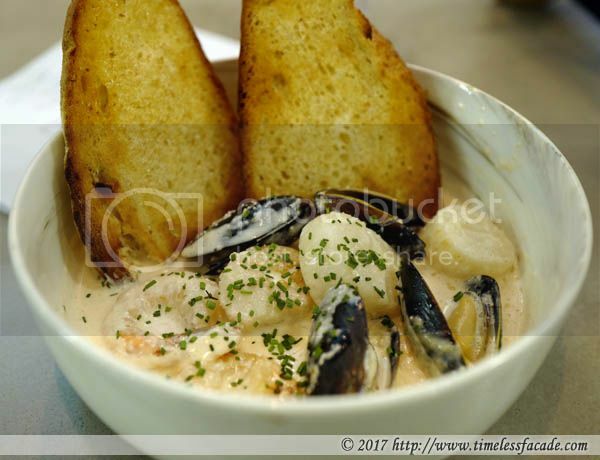 Rich, creamy soup base coupled with scallops, prawns, mussels and served with 2 slices of crisp garlic toast; absolutely delicious. Only gripe I have is the miserly and inconsistent amount of soup; it ranges from little (~ 6-8 spoonfuls) to very little (~ 4-6 spoonfuls).